Re: Washingtonia's any pics of wrapping technique? and how soon? We have 4 here of various sizes, we normally we protect them all but last winter we didn't do the biggest one, thinking it's big enough to be ok. It had at least a 3ft trunk, note it had, as it is no more, it was such a lovely palm but it is no more. The others are all fine. It is up to the individual, if you go to the trouble of protecting your plants or not but if you don't you run the risk of losing them. So as long as you are quite prepared to loose what ever it is, don't protect it. Cordyman, Unfortunately your Washies are still seedlings and will be very vulnerable to freezing right through in a -5/-6C night. It is not a height thing it is thermal bulk that makes the difference. I think you have no option but to cover on frosty nights, but don't 'wrap' as that implies just covering for the winter and you will lose it to rot if you do. A big Washie has a lot of leaves which will help protect the heart from frost. Yours have 2 leaves so there is no protection. I'm sorry to be brutally honest. 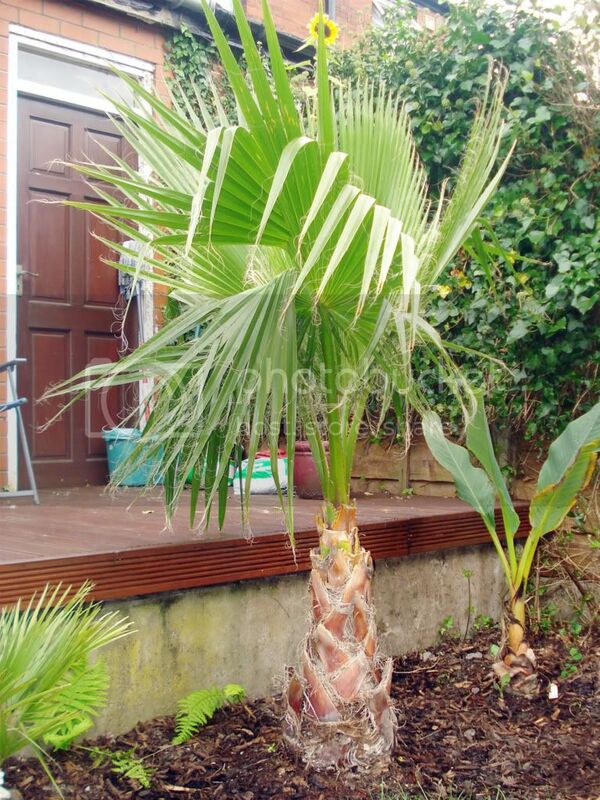 Washingtonia is extremely marginal in the UK and one very hard frost in a mild winter could take the small (under 5 feet) ones out. People look at the coldest a mature palm can take and then plant out seedlings in the expectation that they will survive. There will always be some who come back saying that their small one survived, but that is a case of extreme microclimate being on their side. There is no microclimate when planted out in the middle of the garden and they will be subjected to radiation frosts, rain, and snow from overhead and every direction it may blow from. I would suggest you have 3 or 4 layers of fleece with stones in tied into the corners, and throw this over the palms not wrapping, just covering, when frost is forecast then when the frost has gone remove it. 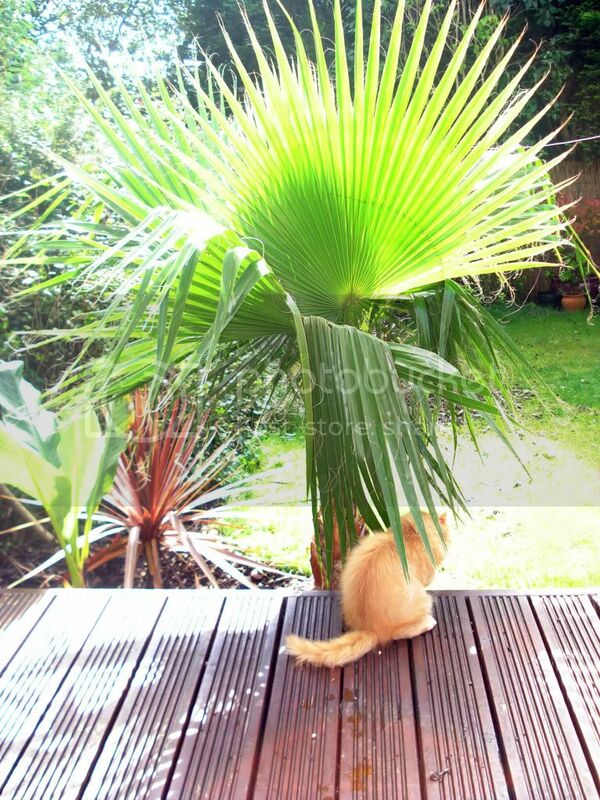 The bottom line is if you want to plant out a small fan palm, the only one reliably hardy in the UK is a Trachycarpus. Even small Chamaerops can be seen off in -6C. If you want a Washingtonia that stands a chance without a lot of work covering and uncovering during winter. Think Shelter, think microclimate, and above all don't think small, don't even think big, think huge, that will be delivered on a lorry. This is mine against a west facing wall, with the covered bit to the north. A good microclimate and it was not planted there by fluke. I knew I was likely to lose it, but it was too big to stay inside. see HERE for the history of the palm. cordyman wrote: Anyone think they are big enough to make it through the winter themselves? Good luck, I hope they come through for you. If we have a winter like last year i don't think you have a chance with them at that size planted out no matter what you do My biggest one (similar size to daves) has always come through the winter fine with a rain shelter. It was dug up and potted last autumn (no mean feat) and given a rain shelter and a duvet wrap on the coldest nights. But the combination of the strss of digging up and the cold killed a plant some 9-10ft tall overall with a trunk diameter of over a foot. Other palms that were also dug up and potted, Trachies, Butias, Large Phoenix canariensis_CIDP (3ft trunk almost 2ft dia and 14ft tall overall and weighing in at about 2/4 of a ton with the rootball) all came through OK. If you want a washy for more than a pot plant or summer bedding you need to buy big!!! GARYnNAT wrote: My biggest one (similar size to daves) has always come through the winter fine with a rain shelter. It was dug up and potted last autumn (no mean feat) and given a rain shelter and a duvet wrap on the coldest nights. But the combination of the strss of digging up and the cold killed a plant some 9-10ft tall overall with a trunk diameter of over a foot. That's a shame Gary. but I think you dug it out a bit late. Mine had a very bad transplant in 2000, but was moved in May so had a whole season to sulk, but slightly recover, before the onset of winter, which was not as cold as last winter. Thanks for continued advice guys, if they don't make it x2 trachies are going in their place! I'm planning some kind of rain shelter, will post pics once i've made it! The roots on my small washy i planted in april are realy solid in the ground .Not easy to dig up would of been better kept in pot.Theres 1 opposite on my road no protection last year . And 2 roads up no protection both front garden near house near a wall .There leaves turned brown but grew back .The same in weymouth front garden near wall .So close to the house be hell to move later . There all small palms . I thought this following link was quite relevant to this thread and was interested in other members views on this article (if of course they have one). I'd agree with Gary on this one. Exotic gardening for many plants is still in it's infancy, so what we all did 10 years ago is probably different to what we would do now. It is amazing how new information can totally supercede what we were doing before. The basjoo protection in that page I learned from Angus White of Architectural Plants back in the early 1990s and was based around the -19C temps they got at the Nuthurst Nursery in Feb 1991. Ok I've been growing Washingtonia from seed since the late 1970s, and lost my first batch of 5/6 year old palms, that were planted out, in the winter of 1984, so since then have grown them as a pot/tub plants until they got too big to house. Only then did I try them outside again. 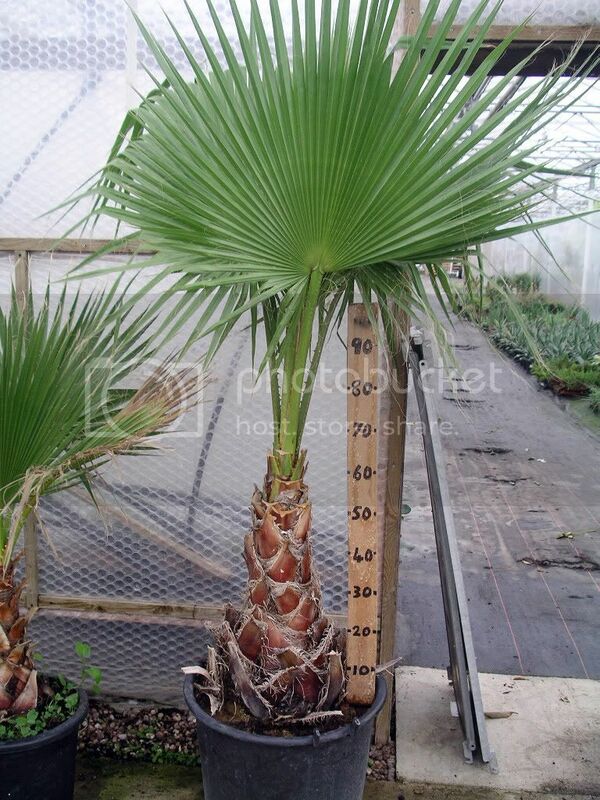 I expect some debate over these figures, they are just my enterpretation of Washingtonia robusta hardiness. Dave i think those figures are pretty much spot on, i know someone will come on and say they planted a small seedling and it took minus 6 with no problems... if so they are very lucky or have an extraordinarily good micro climate small ones are best kept as a pot plant until they reach a decent size. OK Guys that's great - I have protected a Musa Basjoo in the past with Chimney pots stacked and straw all held vertical with a huge iron spike to hold it (before I moved house and planted these new ones I was interested in protecting) - I was also concerned about some new 4 & 6 ft Dicksonia antarctica I've put in this year, I was going to chicken wire round the top and stuff with straw before balancing some kind of waterproof pot on top (after losing an unprotected smaller one last year). I will take your advice of not protecting the Musas and stufffing the crown of the Dicksonia antarctica with a ball of fleece, it'll make my life easier as I was going to try and source all these bits and pieces (plastic land drain offcuts for the musas etc) so hopefully they'll all come through OK. Some interesting stats about the Washies Dave - I bought a couple of cheap small ones from the B&Q sales - I think I'll use them as summer bedding! Right, I've got one (WR) and put it in the ground at the beginning of August. I'm definately going to winter protect it with a vengence for the next three winters, even though it's dimensions are..."Diameter at base is 26cm"
You do mean Diameter and not circumference Dave? Any chance of a thread to show some winter shelters and some examples...would be much appreciated folks three pics here of the palm. Sept 15th, been in the ground 6 weeks.